When the summer arrives in California I get so excited. I love shorts and bathing suit weather. I spend all my free time outside. After enjoying the pool, gardening, and soaking up the outdoors nothing feels better than getting into my bed. 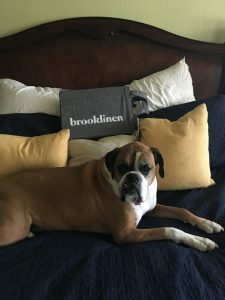 Brooklinen created the BEST SHEETS EVER at an accessible price. Costco used to be my go to for sheets but after using Brooklinen I won’t ever go back to just average sheets. After seeing an ad I was intrigued and stopped by the website. The caught my eye and after communicating back and forth with a representative I decided on the solid smoke set. Their customer service is incredible! We have been sleeping with the sheet only. If you are looking to update your bedroom start check out Brooklinen products. Their beautiful sheets are the perfect place to start. I would love to see them offer some personalization options. My Nana used to gift sheets for wedding gifts and personalize them herself. I can use a needle and a thread to sew a button and that’s about it! Maybe I should add embroidery to my goals book.